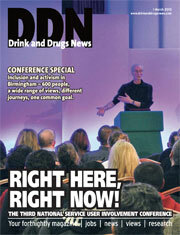 Welcome to our special issue, celebrating our recent DDN/Alliance service user involvement conference. Right here, right now! felt like the right title for it, as hundreds of delegates – three quarters of them service users –surged through the doors of Birmingham’s Holiday Inn.It was a truly vibrant and enjoyable day. The special thing about this conference is its inclusivity – so crucial at this politically delicate time. With a conference programme that challenged everyone from the outset with its very different perspectives (enter Theo van Dam talking about making sure drug dealers were socially responsible, followed by Jacquie and Eve from SHARP who were discussing the ‘recovery movement’) the audience listened with respect to views they didn’t necessarily agree with. It might not have worked, but it did,because the speakers reminded their audience of common goals. Recovery is about choice, said Jacquie Johnston Lynch, and not about forcing everybody into abstinence before they are ready. Her words were a reminder that we should never champion one group over another, but that it is our responsibility to listen to people and protect their interests and their right to treatment – whatever form that might take.We should savour the respect shown in that room full of people with different views – views that the pushbutton voting system showed were diverse. This mutual respect doesn’t happen in some other environments,where the recovery agenda in particular is being used as a propaganda tool to lobby politicians in waiting.We have to take the positivity beyond one day in a conference room and use it to champion inclusivity throughout this field. I would propose that a respect agenda goes hand in hand with any recovery agenda,because the inspiring work going on all round the country, shared between delegates from all kinds of services and support groups, should never be overlooked.